This tutorial walks through how to make your webcam videos look better. If you’re live streaming, creating video courses or tutorials, or just Skyping, here are tips for making your videos look better. 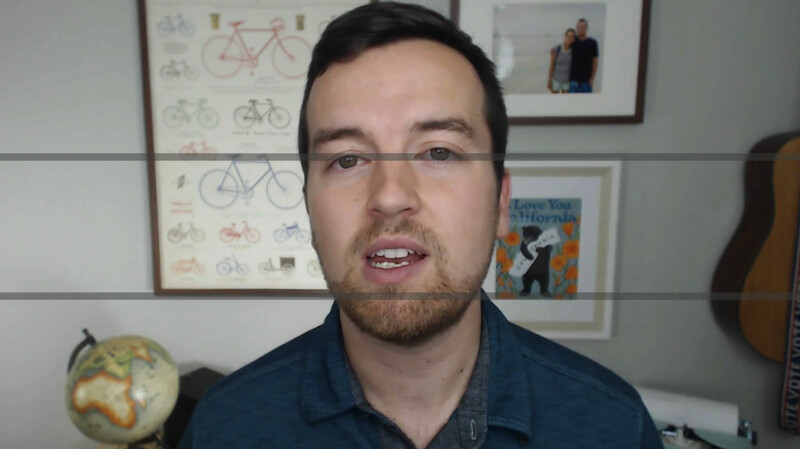 The easiest thing you can do to make your webcam video look better is fix your framing. Make sure the webcam is at eye-level (not angled up or down at you). Put yourself in the center of the frame. If you break your frame into thirds with horizontal lines, your eyes should be around the intersection of the top and middle third. See example below. Webcams aren’t great at capturing video in low-light situations. Every digital camera has a sensor, and while some high end DSLR and mirrorless cameras can shoot in low light, webcam sensors just aren’t that great. You’ll notice in lower-light situations, you might see a lot of digital noise and grain. Your webcam doesn’t pick up a lot of details. And if you’re just using a desk lamp or overhead ceiling light, you’ll get nasty shadows across your face. See image below. I use a simple paper lantern setup, with a paper lantern on either side of the webcam. See a diagram of my setup here. Your background should add to your story and to your video. For one thing, you should definitely clean up your background. That means do your laundry, make your bed… haha. 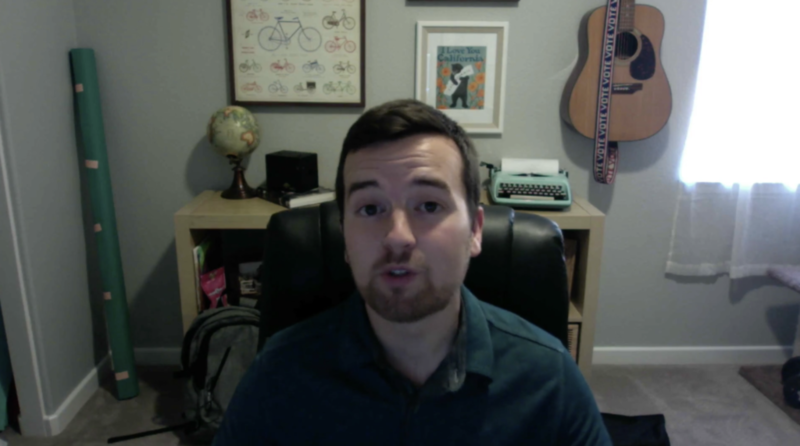 Seriously, try not to film anything professional with an unkempt bedroom in your background. The image above shows my initial setup before adjusting my background. Because the webcam is so wide, it captures so much of the room that can potentially distract. One thing I do is move closer to my background so that it takes up more of the frame. See image below to see the transformation. You can also see the difference that a couple lights can make! Another backdrop option is a clean paper backdrop like the one below. I purchased this one on Amazon from Savage Paper. They make paper backdrops in a number of colors and sizes – perfect for any occasion. While you’ll get decent results from adding lights, changing your background, fixing your framing, your internal webcam might not be that great. Even on my 2013 iMac, the internal webcam wasn’t that great. I upgraded to the Logitech C920 (they have a newer Logitech C930 version). They’re about $50 and $80 respectively. Now, I can record 1920 x 1080 HD videos through my computer. Make sure you go into the application settings to adjust your camera setting (i.e. ScreenFlow, Quicktime, Skype, etc.). The images above also show the before and after – swapping from internal webcam to Logitech C920. While visuals are very important for any video, audio is arguably ore important for webcam videos. The internal microphone just won’t cut it. Luckily, USB microphones like the Blue Snowball, Blue Yeti, or Rode Podcaster are affordable options that make your audio sound amazing. Read this article if you’re wondering what microphone you should use. Whatever microphone you use, make sure to properly set your levels either in your computer’s audio input settings or in your video application (if it has the option). Are you ever using a webcam or talking to someone online that is using a webcam, only to have the focus go in and out or the exposure brighten or darken? While that’s not a terrible thing if you are just live streaming or chatting on Skype, you don’t want that to happen if you are recording a video for professional use. I use the Webcam Settings application for Mac computers to manually adjust my exposure, white balance, and focus. I also make sure to turn off auto white balance and focus so it doesn’t adjust while filming. With these 6 tips, you should be able to make your webcam videos better than ever!